Located on Canada's north-west coast, Desolation Sound is a wild and rugged place. Winter gales give way to brief summers, and the windswept landscape has little arable land. European settlers on this remote coast did not let the elements stop them from carving out gardens to plant apples and roses. These foreign seeds were coaxed to flower and fruit among the moss, ferns and native berries of the rain coast. Most of these remote homesteads have been abandoned and reclaimed by the wild, but in a forgotten garden you may still find a hardy rose entwined around an arbutus tree or sprawling untended in a sunny glade. sizing The sample is knit in DK weight yarn, and measures 66 by 30 inches. Rosebud is also exquisite in sock or lace weight yarns, and you may work more or less pattern repeats to adjust the finished size. This particular lace stitch pattern looks best if it is knit at a fairly tight gauge (as far as lace goes). notes This shawl is knit from the centre top down to the scalloped edging, formed by two increasing triangles. The lace pattern is charted, and all WS rows are purled. 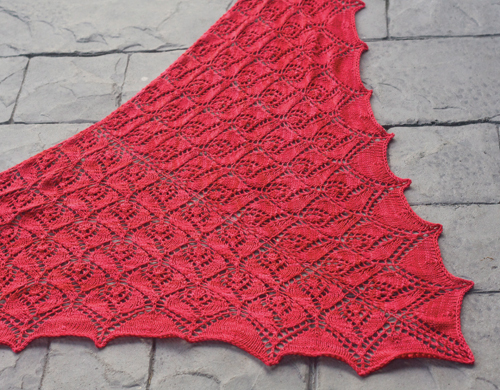 The rosebud shawl pattern is available as an individual pattern download, or as part of the Pacific Knits collection.